Researchers from Cambridge University and Ignis Innovation developed a new energy harvested that sits inside a mobile phone with an OLED display and harvests energy from the light that is projected to the display's sides. The researchers say that up to 64% of the light is lost in typical OLED displays - much of it projected to the edges of the display. 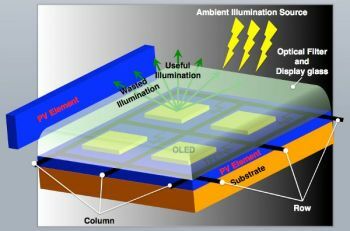 The idea is simple - to place an array of thin-film hydrogenated a-Si solar cells around the OLED. These cells can also harvest ambient light. The researchers made a complete system design - instead of charging the battery with the power generated (which would be quite complex) they added a supercapacitor for intermediate energy storage. They say the system achieves an average efficiency of 11% and peak efficiency of 18%, while the PV array converts around 5% of the ambient light to electricity. They say that on a typical 3.7" OLED display the maximum power output is 5 milliwatts. Useful, but not significant compared to the phone's power needs, so it's not clear whether this is worth the extra cost, size and weight.